Ta Da! : I love turquoise! Things I like, things I make, and things that make me happy. My mother in law visited a while back, and bought a ton of stuff that she had cleared out of her cupboards. "take what you want, and the rest can go to the dusty" she said. "the Dusty" is her name for Goodwill. 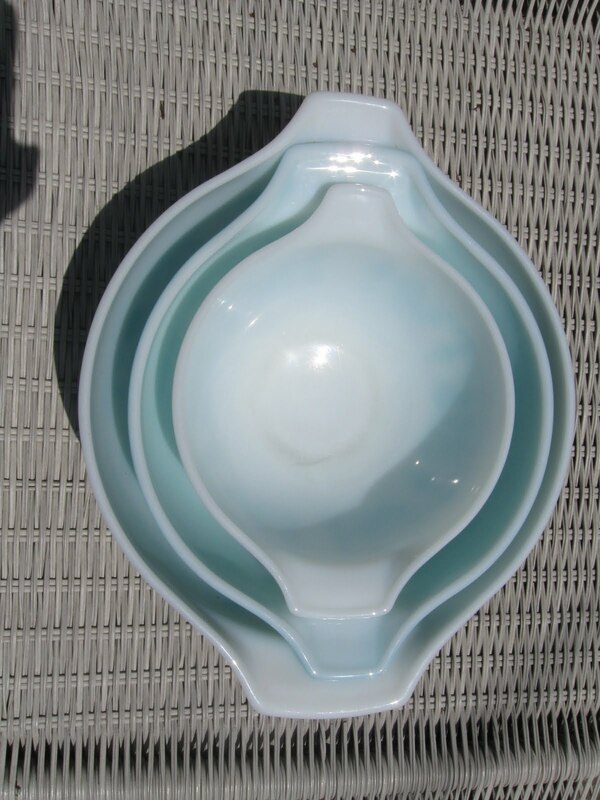 I was instantly attracted to the PYREX white and turquoise bowl. I love the feel of it, the weight of it, and the sound that it makes when it is put down on the table. I was excited to show it to my husband and I served a salad in it that evening. My husband saw it, and said "oh no, not the barf bowl" He remembers this bowl in a rather negative light, as it was the bowl that was placed beside his and his brother's beds when they were ill.
Now I am not allowed to use my beautiful bowl without hearing "gross, or nasty, or get it off the table" my son even chimes in, and this story is a good 30 years before his time. I secretly use the barf bowl for mixing cake batters, and making marinades, but never for serving. The barf bowl is the one on the far right. Since I have discovered this newfound love for PYREX, I have found several matching bowls at Goodwill, and all under $2 each. They stack nicely into each other. I also have found a beautiful website that shows all the patterns of PYREX that ever was. I find myself just looking at the photos, and reliving memories of eating at friends houses, cottage visits, and family dinners at the Ponderosa. Visit if you get a chance, it really is fun. Perhaps you'll even relive some memories that make you smile! These are a few of my favourite things: creating, gardening, thrifting, laughing, baking, sewing, gifting, halloween, re-using, collecting, and teeny-tiny things. Not necessarily in that order. There are ALWAYS many unfinished projects in different stages at my house.